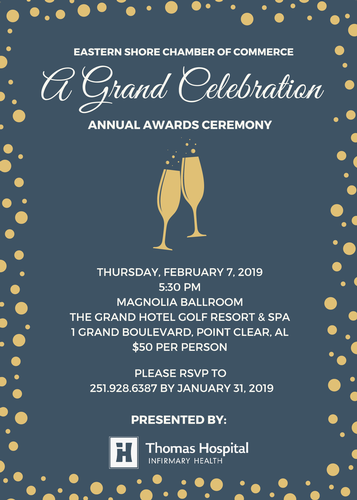 Name: Chamber Annual Awards Ceremony: "A Grand Celebration"
Join us for "A Grand Celebration" at the Eastern Shore Chamber of Commerce Annual Awards Ceremony presented by Thomas Hospital, Infirmary Health. We'll mark the end of 2018 with our annual awards presentation, the passing of the gavel, food and fun. Tickets are $50 per person. Please RSVP to 251.928.6387 or register online by January 31, 2019. Please RSVP by calling 251.928.6387 or register online.